Farmers can’t choose the weather or the prices they get for their crops, but they can choose the best seed for their growing conditions, thanks to research by Mississippi State University. Brad Burgess is director of variety testing and foundation seed at MSU with the Mississippi Agricultural and Forestry Experiment Station. 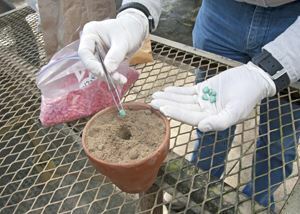 He said the information is valuable because it allows growers to see an unbiased comparison of all the varieties tested. Burgess is responsible for the testing programs for corn, grain sorghum, peanuts, soybeans, wheat and oats. For each crop, researchers plant numerous varieties each year and grow them under conditions found at locations throughout the state. (Photo Above) Mississippi State University conducts large, on-farm and small-plot tests each year to compare the performance of several key crops for the state. 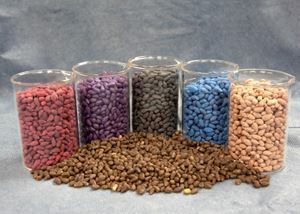 These cotton seeds have been coated with different seed treatments. (Photo Below) Mississippi State University performs tests and accumulates data on numerous seed varieties each year to help farmers in their planting decisions. These corn seeds were being planted in an MSU lab on Nov. 18, 2014. Yield is a primary consideration, but growers also look at the data to see which varieties consistently perform well. Brian Williams, Extension agricultural economist, said variety trial information can be of tremendous value to producers. Information provided in the trials can help producers to identify which varieties have been proven to perform best in their specific areas of the state. There is a wealth of information available on the different seeds, and gathering and evaluating that information can be time-consuming and complicated. “Having all the data at their fingertips in one place can prove invaluable in the decision-making process, allowing producers to compare data and performance from varieties that they are familiar with, as well as from new or unfamiliar varieties,” Williams said. Rocky Lemus, Extension forage specialist, said MSU tests 12 different forage species, including bermudagrass, bahiagrass, tall fescue, clovers, alfalfa, summer annuals and annual ryegrass. The forage program tests more than 130 varieties within those species. Forage tests are grown at MSU experiment stations in Poplarville, Newton, Starkville and Holly Springs. Information from the MSU tests allows producers to determine what forage variety will perform best and be most economically sustainable in a specific area. Bobby Golden, Experiment Station agronomist, is responsible for rice testing. He said during 2014, MSU evaluated 21 conventional and 15 Clearfield rice varieties at seven locations in the Delta. Clearfield rice is a system developed to control unwanted red rice, a weed in commercial production. Unlike most upland crops, the majority of rice varieties are developed by public breeders, with MSU, Louisiana State University and the University of Arkansas responsible for most recent public rice releases. “We evaluate both publicly and privately developed rice lines, including inbreds and hybrid varieties,” Golden said. “We strive for consistency and try to provide a data set containing different rice varieties that outlines rough and milling yields over time. “This is very important because a new variety may have a very good yield potential in year one, but how does it react to a range of cultural environments or in years with adverse climatic conditions? If you have a history of how a specific variety has yielded in your area, you can feel confident where your yield range is going to be if everything goes smoothly,” he said. Darrin Dodds, Extension cotton specialist, oversees cotton testing in large trials conducted on producers’ fields and small-plot trials conducted at MSU. These small-plot trials are conducted in eight or nine locations around the state on a variety of soil types and under both irrigated and nonirrigated conditions. Large-plot variety trials differ in that MSU personnel plant the seed and then rely on private growers to manage the crop. This year, MSU has eight small-plot and 25 on-farm variety trials. Researchers tested 52 varieties of cotton in small plots and 10 in the on-farm locations.